Insect-pathogenic baculoviruses have established potential as biological insect pest control agents. However, slow speed of kill relative to chemicals and continued feeding following application limit their effectiveness in preventing crop losses. 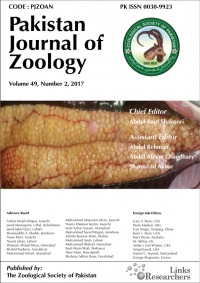 Here we studied the food consumption and weight gain of the cotton leafworm Spodoptera litura following application of two viral doses of Spodoptera litura nucleopolyhedrovirus (Pakistan isolate SpltNPV-Pak-BNG). Infected larvae with final polyhedrosis (disease resulting in dissolution of larval tissues and accumulation of viral occlusion bodies) exhibited reduced food intake and weight gain relative to uninfected larvae. The unexposed larvae and the larvae that were exposed but survived exhibited the same food consumption and weight gain. This study did thus not reveal any sub-lethal effects of exposure to the virus on food consumption and weight gain. There was no viral dose dependency observed in food intake or weight gain by infected larvae, suggesting there is no increased crop damage upon virus treatment but rather a decrease to be expected.